1. Take a bowl mix All purpose flour, 1 tbsp of oil,salt and water and make dough like chapati dough. Keep it aside. 2. For Stuffing,Take a pan heat 1 tbsp of oil in it first add chopped garlic, chopped white part of spring onion saute for a minute.Add chopped cabbage and carrot and saute until cooked. 3. Add salt , pepper and soy sauce, at last add green part of spring onion mix well and switch off. Step 3: Put 1 tbsp of stuffing(sauted veggies) in centre of disc. Step 5: Seel the end as looks in the figure. Step 6: Do all the momos. 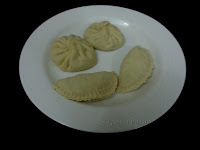 if it's not comes good, use a dumpling mold for making similar shapes like this. 5. 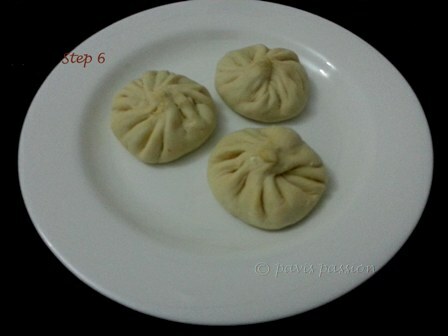 Stream the momos in a streamer for 5 Min's. 6.Serve hot with tomato garlic dip. Take a Mixer add chopped Tomato and Garlic grind it into paste . Heat oil in a pan add the ground mixture and boil until the raw smells goes. 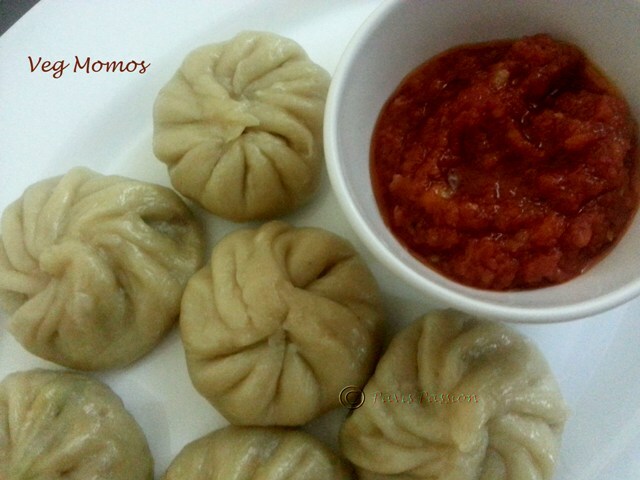 Serve hot as dip for momos. Note:The dough you make should not be more fluffy it will not stand like dumpling.